$5.77 This item is selling for $5.77 on eBay. A M 6-5180. 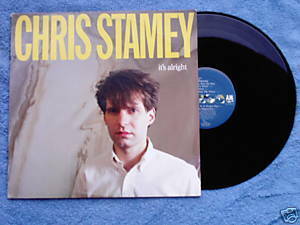 Chris Stamey It's Alright LP 1987. Includes title track, Cara Lee, From the Word Go, When We're Alone, The Seduction, Big TIme. Promotional copy. Cavalcade of musicians include Marshall Crenshaw, Lisa Herman, Mitch Easter, Ted Lyons, Cathy Harrington. Photography by Carol Whaley. Vinyl is VG; cover is VG with minor corner wear and some ring wear. Reverse is stamped in gold with "Loaned for Promotional Only".